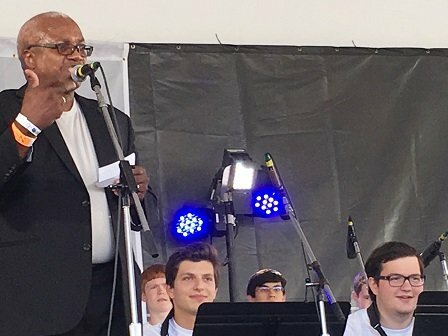 Marlborough – Since 2013, the Massachusetts Music Educators Association’s (MMEA) All-State Jazz Band has appeared at the Newport Jazz Festival. Featuring the best students from around the state, the band is presented at Boston’s Symphony Hall during MMEA’s annual all-state festival. This year, two Marlborough High School jazz ensemble musicians, Justin Bartlett and Matthew Pearl, were invited to perform at the Newport Jazz Festival. This year, Bartlett and Pearl were accepted into the MMEA All State Jazz Ensemble. Given that the State Jazz Ensemble is made up of only 18 high students, this is an especially significant achievement. Bartlett, a 2017 MHS graduate, plays the alto sax, and Pearl, a junior at MHS, plays the tenor sax. Carter is a nationally known and regularly requested guest conductor, artist and clinician. Marlborough High School’s music program, guided by Jonathan Rosenthal, music coordinator for grades K – 12, continues to shine earning the district accolades and awards from national associations.